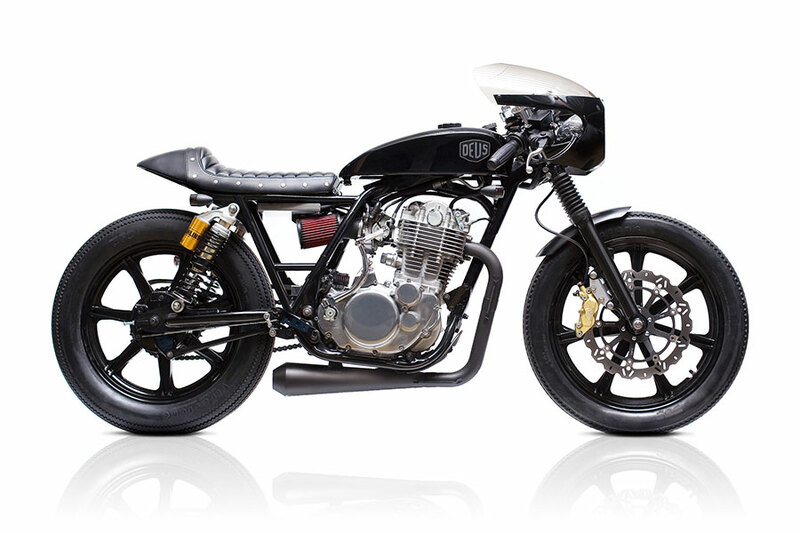 This is Deus Custom’s signature SR build: the Grievous Angel, built using a Yamaha SR400. Also the bike in news right now because it’s owned by Top Gear’s James May and about to go under the hammer later this month at the Bonhams Collectors Motorcycle Sale. Features include: Alloy bullet fairing, underslung stubbie pipe, powdercoated factory mags, clip-on bars, Nitroheads ducktail solo seat and tracker tank, SR frame hand massaged into submission, K&N pod filter kit, CV carb, beadblasted engine case, gold brake calipers and braided lines, AVON Speedmaster™ tyres — all finished in glorious Henry Ford pink. The Bonhams Collectors Motorcycle Sale is on the 25th April.